Photo above by Sefa. All other photos by Stig Nygaard. Fishing villages, cultural immersion, West African drumming classes and Star Beer. “Run! Run!” Lara shouted, bolting off ahead of me. I picked up the pace. Dusk was settling over the University of Ghana, and of everything we’d heard during orientation week, it was the mosquitoes that scared us the most. I busted out the DEET mid-stride and coated myself with a toxic cloud of repellent. Convinced that a single bite from a mossie would land me strapped to a rusty IV in a dingy open-air hospital, I wasn’t taking any chances. We hurried past groups of meandering students. I tried to keep focused on getting back to Volta Hall and the security of our enclosed dorm room as we swerved our way through the vendors at the night market. “Obruni, hey! Obruni! !” I waved my hand in brief acknowledgment, but didn’t slow down. We ran past the internet cafe and the cafeteria, through Legon Hall, back to the main road and up the final steps to Volta Hall, out of breath and sticky with humidity and DEET. We plopped down against the cool, white-washed cement walls of the all-girls residence, and erupted into belly-aching, tear inducing laughter. As a student at the University of California, I had a choice of over 30 countries I could jet off to for my junior year. France, the UK, and Australia were among the top choices for my fellow students, but I had always been fascinated with Africa, and knew that tropical, sub-Saharan Africa was the place for me. The UC system offered placements in South Africa and Ghana, and between the two, Ghana was a hands-down, no-brainer choice. Ghana was a place where I would be a visible minority, a place where I would be completely outside of my comfort zone, and most importantly, a country where I’d be immersed in a society with a vastly different history, worldview, and circumstances than my own. 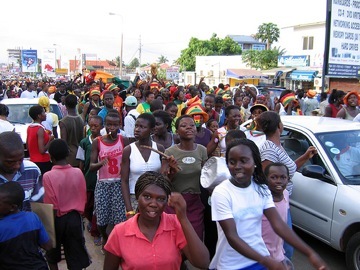 Ghana has one of sub-Saharan Africa’s best developed education systems and the University of Ghana offers international students opportunities that will expose you to the complexities, challenges, and opportunities of a developing nation. Courses are varied, with subjects from zoology to Women’s development to linguistics. The West African dance and drumming classes consistently get rave reviews from international students. The University of Ghana has far fewer resources than most universities in North America and Europe. With no text books available at the bookstore, or even the library, there is a fundamental difference in the way information can be conveyed. The didactic teaching style can leave many international students feeling frustrated. Professors often rely on the archaic system of reading chapters of text aloud during lectures so that students can dictate verbatim and study their notes later. For the first few months of classes, between the thick accent and pidgin English, I wasn’t able to decipher much of anything that was happening in my classes. I sat, stupefied, trying to ignore the claustrophobic heat and curious eyes, and concentrate on the unfamiliar sounds filling my ears. Studying at the University of Ghana was more about personal growth than academics. Fortunately, international students are cut quite a bit of slack, so there is plenty of time to travel, volunteer at a local orphanage, get chased by mosquitoes, or just hang around and drink massive bottles of Star Beer. 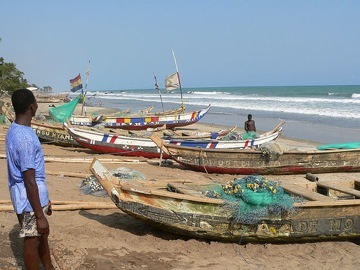 With decent public transit systems, weekend trips are great for exploring the fishing villages around Accra or relaxing at beaches like Dixcove and Basua – where you can swim, nap in a hammock and surf. Exploring the forts at Cape Coast and Elmina involves an easy day trip from campus. These sites provide a stark reminder of Ghana’s role in the trans-Atlantic slave trade. 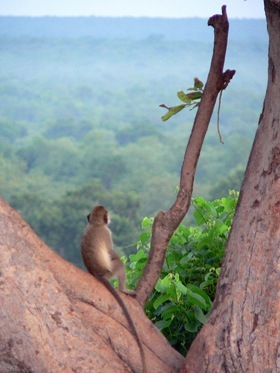 Monkey sanctuaries, trekking, rainforest canopy walks, fetish markets, and trips to Togo are all awesome activities. Togo has some of the best chocolate croissants outside of France. Ghana still struggles with issues of social and economic development, and as an international student it was a hard adjustment. You learn how to fight your way onto a local tro-tro, and how to deal with the constant attention given to foreigners. You become an expert at haggling at the market and enjoying the company of wildlife in your room. Without even realizing it, a new normal will wiggle its way into your life, changing you in ways you won’t fully realize until you come home. I never ran away from mosquitoes again, and pretty soon the DEET was forgotten too. Mosquitoes and all of their itchy bites became part of the reality of our lives in Ghana, just as bucket showers, squat toilets, and daily electricity cuts did, too. Want to study abroad in Africa? Most study abroad programs in Africa are limited to South Africa, Ghana and Egypt. The University of Oregon has one of the most robust study abroad programs in the US, offering placements in 13 African countries! If your university doesn’t offer a study abroad program in Africa, check out the comprehensive list of study abroad opportunities offered by private companies over at Go Abroad. G-Lish is a quality blog where you can find The Insider’s Guide to Ghana. Don’t ask where I’m from, ask where I’m a local.